Twenty-three years after the last shot was fired in the American Revolutionary War, tension between Britain and the newly formed United States was still strong. When the British sailed into New York Bay in 1806 claiming the right to seize and search all American vessels, New Yorkers were outraged. The Seventh Regiment of New York was organized as a state defense force in response. When President Abraham Lincoln called for additional troops on April 15, 1861 the Seventh Regiment responded. Four days later the men left their Tompkins Market armory wearing grey uniforms and a sky-blue overcoat. The Third Annual Report of the Bureau of Military Statistics of the State of New York later recalled “New Yorkers cheered and applauded as the Silk Stocking Regiment marched through the city…Thousands upon thousands lined the sidewalks. New Yorkers welcomed their favorite sons home and a mere year after the end of the war the Monumental Association was organized to erect a statue in memory of those who had given their lives. But things did not go smoothly. Not only was the Association’s planned memorial, in the opinion of the Regiment, too garish; but after a few years the project seemed to have ground to a halt. “In their opinion, the design for the base was extravagant in its proportions, and in the expenditure required; the site in the Park which had been accepted was too distant from the city, and was otherwise objectionable; and, finally, the Regiment, having contributed nearly all the money raised for this purpose, was dissatisfied that operations had been entirely suspended, and that there was no prospect of the completion of the work,” according to Colonel Emmons Clark in 1889. The Regiment launched a coup in 1872 to take over the Association by nudging out members who “had long since ceased to take any active part in the matter, and to fill their places with members who fully represented their views and interests. This was accordingly done, and at its quarterly meeting in October the Monumental Association was captured, and a new executive committee, controlled by active and prominent officers of the Regiment, was appointed, with full power as to site, base, funds, etc.” remembered Clark. Esteemed sculptor John Quincy Adams Ward would be responsible for the bronze statue upon Hunt’s granite base. Victorians were accustomed to the bronze and marble likenesses of statesmen and military heroes in grand, formal poses. But Ward headed in the opposite direction. He chose to depict the common soldier in all his humanness. The figure was not of an officer, but a lone sentry. The Evening World said “It is in the form of a soldier boy in full regimentals on picket duty.” He vigilantly gazes off while leaning on his rifle. 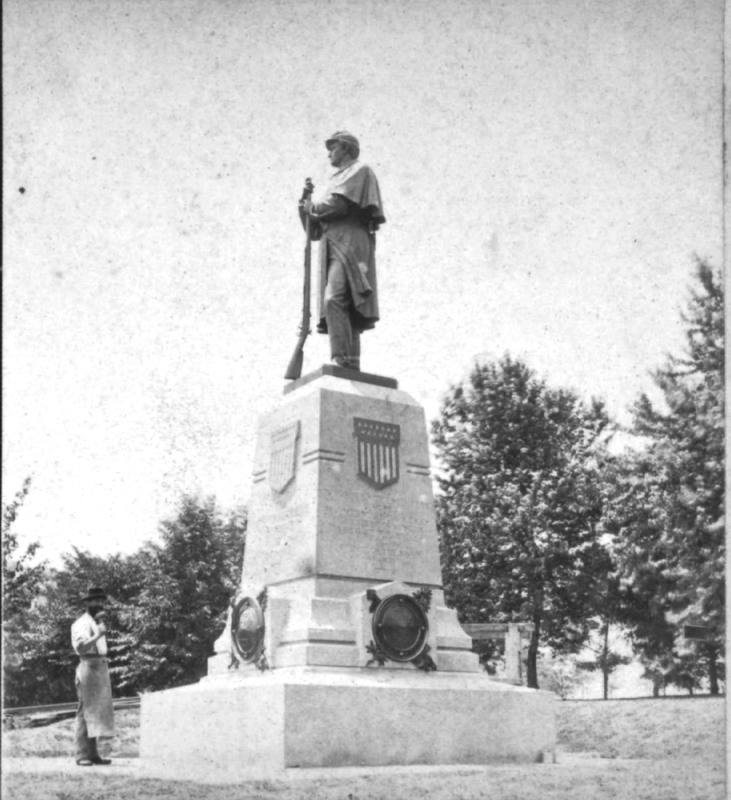 The relaxed pose would influence countless Civil War monuments and town squares throughout the country would erect their own versions of the standing soldier and rifle. 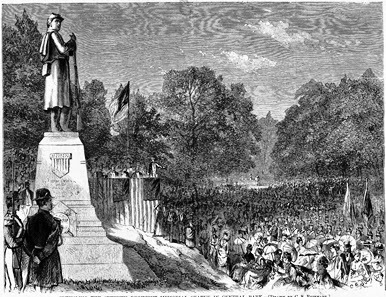 On June 22, 1874 the statue, entitled “The Citizen Soldier,” was ready for its unveiling. 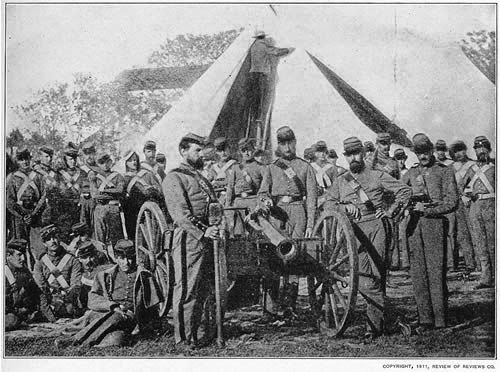 The Civil War veterans assembled at the armory at 3:00 and the current members of the Seventh Regiment arrived there an hour later. The two groups paraded to Central Park on separate routes, meeting up at Eighth Avenue and 69th Street to enter the Park. “During the march of the regiment the drives upon its route are to be kept clear of carriages and pedestrians,” The New York Times warned readers that morning. New Yorkers were understandably offended and outraged when eight years later thieves pried the valuable bronze medallions off the base of the statue. The men were caught and tried separately. One of them, Louis Sigmund, was convicted on August 18, 1882 and sentenced to six months in the penitentiary. A 19th century stereopticon view captures a workman pausing before the memorial. Time passes, veterans die, and memories fade. By 1923 when the statue was rededicated it was more of a Victorian curiosity than a revered memorial. Then in 1927 the dramatic and emotional World War I monument to the Seventh Regiment, now designated the 107th Infantry, was dedicated. John Quincy Adams Ward’s moving 19th century tribute to the citizen soldier became a footnote. But not everyone overlooks the statue. As they did in 1883, birds happily construct their nests today under the bronze cape of the Civil War sentry.